Data centers house sensitive computers that require a consistently high level of critical cooling. A nationally known, leading data center located in the Chicago area offers a full spectrum of data center solutions, from move-in-ready to custom-built. Many Fortune 500 corporations rely on outsourced facility space to help maximize their data center strategy and IT resources to ensure their data operations run efficiently. With 102 data centers in North America and over 130 facilities across more than 30 markets worldwide; this data center provider focuses on minimizing any change of cooling disruption that can impact uptime, downtime incidents and costs associated with cooling. The facility in Franklin Park, Illinois, is 800,000 square feet and split up between 3 buildings. 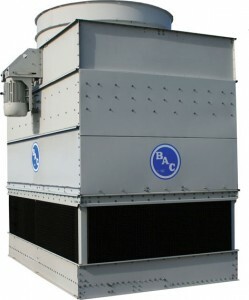 Vital cooling operations are equipped with BAC cooling towers, Trane and Greenheck RTUs. Each cooling tower is 800 tons, while each RTU is 25 tons. With the facility being located next to the extensive Cook County Forest Preserve, local environmental conditions caused system problems. 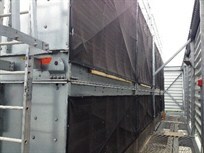 Cottonwood seeds were getting sucked into strainers on the rooftop units and creating clogs. 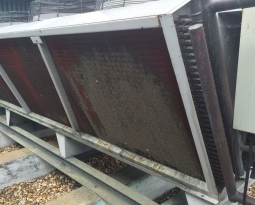 The facility Chief Engineer had heard of a prefilter to stop this type of problem and contacted their local filtration expert, Carolynn Gallmann, of DP Systems, based in Addison, Illinois. 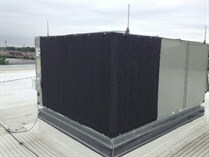 The large cooling towers were fitted with custom sized PreVent Air Intake Filter Model BHA, containing a high abrasion filter media. 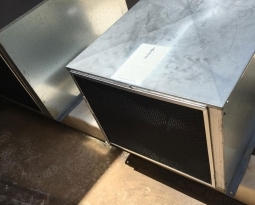 Each RTU was fitted with PreVent Air Intake Filter Model U, containing a woven electrostatic polypropylene to capture even more of the finer particles. 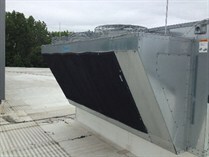 These air intake filters act as a primary pre-filtration defense to help prevent the damage and extensive maintenance that large volumes of debris can cause. 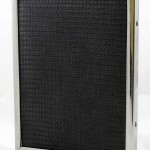 They can be custom designed and manufactured to fit any sized air intake. Designed for strength and durability, PreVent Air Intake Filters are UV protected and stand up to extreme outdoor exposure, with a variety of design features that allow them to be attached easily and securely. 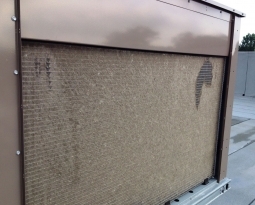 Before PreVent Air Intake Filters were installed, coil cleanings were required 3 to 4 times per year. 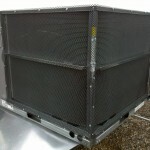 Now that the PreVent Air Intake Filters have been installed, coil cleanings are only required one time per year. 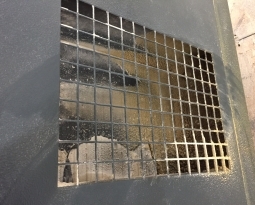 The filter screens can be quickly brushed clean with a broom, as needed during peak cottonwood season.